Wisconsin Sports Services (WSS) has a received a grant from the Green Bay Packers Foundation that will be applied to the WSS program, Trusted Coaches. The funds will directly benefit the All-American Youth Football League (AAYFL) based in the Milwaukee area. The AAYFL is the largest youth tackle football league in Wisconsin. 38 different clubs represent the AAYFL, and Trusted Coaches will allow each club the opportunity to have their coaches obtain the necessary background check and football specific training, such as the USA Football's Heads Up Tackling Certification. Trusted Coaches is an online risk management platform designed for youth athletic associations. Trusted Coaches is a one stop shop for youth athletic administrators by saving them time and providing an affordable solution for coaches to receive sport specific training and a national background check, all under one platform. 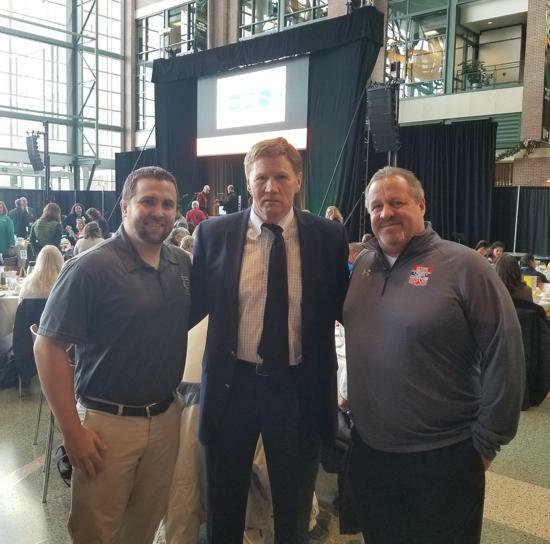 Pictured below is Kyle Flanagan, Director of Development for Wisconsin Sports Services, Mark Murphy, CEO of the Green Bay Packers, and Dan Snell with the AAYFL. To learn more on how Trusted Coaches can benefit your local youth athletic associations visit www.trustedcoaches.org.